Watch the band perform the classic Wide Open Space on the legendary 90s programme and you’ll wonder where the last 20 years have gone. 17 February marks 20 years since Mansun's seminal debut album was released. Wow. The Chester band's Attack Of The Grey Lantern was an ambitious album that almost had a concept attached to it - the story of the comic strip-style hero, The Grey Lantern and the characters that inhabited the village he lived in: Dark Mavis, Albert Taxloss, Chad and the transvestite Stripper Vicar. Singer Paul Draper told Select magazine at the time: "The album is about this village of people with really disgusting morals and the Grey Lantern sorts them out. At the end of the album it all gets resolved and you find Mavis is actually the Stripper Vicar." Confusing? Yeah. Bonkers? Certainly. But why not celebrate the record and commiserate how old we all are by looking back at this classic performance of the album's big hit, Wide Open Space. 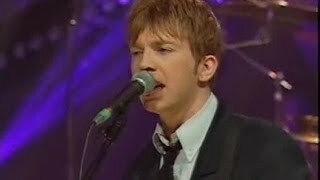 The band performed it on the non-more-90s TV show TFI Friday, with Chris Evans in the hot seat. Stirring stuff.